Modified Magazine ran an article on the Buddy Club demo R35 GTR. Late last year, the car was in the US for a Buddy Club track day at Willow Springs. On that day it rained, but the car still did pretty well. The car sports carbon fiber accents all over the body, and to go with the look on the outside, the car runs an AMS Alpha 9 package. No report on the curb weight of the car with the carbon fiber pieces and the Buddy Club seats inside. 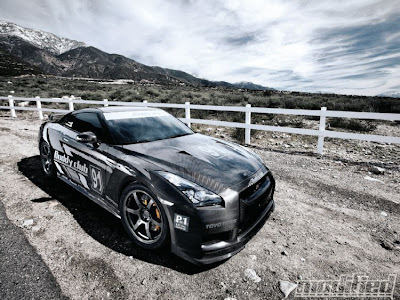 Head over to Modified Magazine for the full article and specifications on this Nissan GT-R.
By utilizing dry-carbon-fiber body pieces to replace the factory hood, front bumper, fenders, side skirts, door skins, rear wing, rear diffuser, mirrors and even the roof skin, Buddy Club has shaved a good amount of weight from this heavy car.